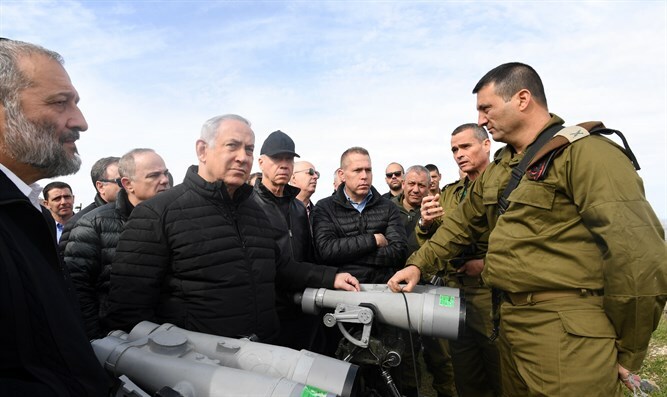 Prime Minister Binyamin Netanyahu and members of his cabinet toured the Golan Heights Tuesday, and visited an IDF position overlooking the Israel-Syria border. The trip, which was intended to give Israel’s senior leadership first-hand knowledge of the country’s security challenges, included meetings with senior army officials like IDF Chief of Staff Gadi Eizenkot. During the visit, Netanyahu vowed that Israel’s security forces would bring the Israeli-Arab terrorist responsible for Monday’s deadly terror attack to justice. At approximately 2:26 p.m. Monday afternoon, 19-year-old Israeli-Arab terrorist Abed al-Karim Adel Assi stabbed Rabbi Ben-Gal as he waited by a popular hitchhiking spot in the Samaria city of Ariel. Ben-Gal suffered a chest wound during the attack, and died shortly afterwards. The terrorist, a resident of Tel Aviv-Jaffa, is the son of former Palestinian Authority resident from the city of Shechem (Nabulus), where the terrorist reportedly visited on a regular basis.